Derek Esquivel is my business partner. He was featured in episode 2, and he is known as the CRM dude because we built a CRM together. Derek will be my co-host moving forward. He brings a unique perspective because he comes from the marketing business not the real estate business. When it comes to showing real estate agents how to market, the concepts are really the same. Concepts like publishing good content are universal. Discount brokerages like SRE Matrix and technology like Trulia and Zillow make it necessary for realtors to step up their marketing skills and really add value to the equation. Things like videos, photos, social media, and other marketing techniques are a must. The times when a realtor could just put a listing on MLS and a sign in the yard are gone. There has been a recent paradigm shift in the value proposition that realtors need to add. 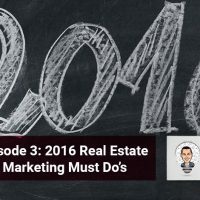 In my latest blog post I talk about, “The Top 6 Real Estate Marketing Must Do’s In 2016”, and we are going to discuss them today. Be a listing agent. The agents that sell a lot have a lot of listings. To be a good listing agent you need to create a better marketing system. Be Savvy with the Internet and technology. You can even use your listing to pick up more business as you get exposure from facebook ads, videos, postcards, and other marketing techniques. Create a referral marketing system. Referral and repeat business make up about 61% of all agent business. When people in your database think of real estate, you want them to think of you. It’s a big deal when people are making the largest financial decision of their life. They want someone they know they can trust working for them. Create a better process. Being a real estate agent isn’t a job, it’s owning a business. A business has to have a process they follow with each customer. Without a process you have no brand. A step by step process will improve the customer experience and help with referrals. Become the expert. Using content marketing to become the expert will get you in front of people who are looking for your expertise. People will want to use you because you are the expert. Don’t sell, use your expertise to build relationships. Be an expert in your local market and in the facilitation of the process. Start using video. The most important medium ever is so easy to distribute. Video can be more engaging. Video can be used with email marketing, content creation, social media, and listings. If people see you on video, they will automatically perceive you as an expert. Set up multiple lead generation systems. Have the leads come to you instead of chasing after them. You can use Facebook ads, internet leads, blogging, video marketing and direct mail. Just be sure that you have a plan in place when that call comes in. I am about to hire agents and I must say this is a good guide. I shall teach your insights to them. Thank you for a very informative article! Such a Good Read! Cheers! Thanks Jose you should check out the Attract & Retain Formula. Put all of these marketing systems in place wihint your team and office and you won’t have to recruit anyone, they’ll come to you. Thx for checking it out! Great post! Very informative. I’m getting into the idea of investing on real estate. I’m doing research at the moment. Forwarding this to my fiance to raise some points. Cheers!